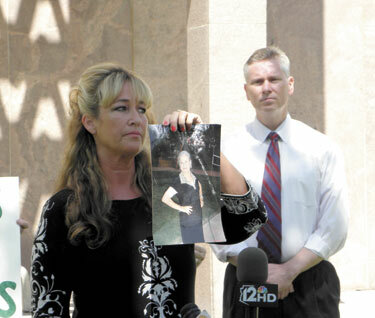 Former County Attorney Andrew Thomas, pictured with Patti Gomes, one of several victims of Arizona’s probate court system, held his first of a series of press conferences advocating support for Proposition 115, a constitutional amendment to bring accountability to our courts. 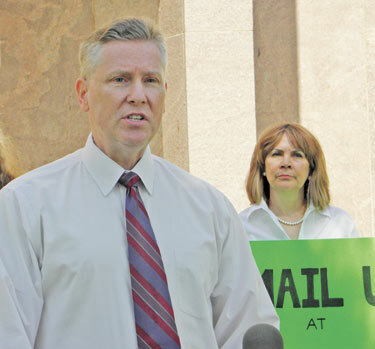 PHOENIX – Former Maricopa County Attorney Andrew Thomas, on behalf of Citizens for Clean Courts, held the first of a series of press conferences on May 31 at the state capitol to advocate support of Proposition 115. House Concurrent Resolution 1001 passed overwhelmingly with bipartisan support in the legislature to become Proposition 115 on the November ballot. HCR 1001 proposes to amend various sections of Article VI of the Arizona Constitution relating to the judicial department. While serving as county attorney, Thomas attempted to clean up corruption in the courts, only to find himself facing a force much larger than he imagined; one that eventually resulted in his being disbarred along with Deputy County Attorney Lisa Aubuchon and suspension of Deputy County Attorney Rachel Alexander’s license. The saying, while repeated by many, first arose as part of a quotation by John Emerich Edward Dalberg Acton, otherwise known as Lord Acton (1834–1902). Thomas introduced Patti Gomes, who said it was uncomfortable talking about her situation and initially thought hers was an isolated incident. Gomes stated the court ignored living trusts and living wills, while it denied her petition to become her mother’s conservator. She said the court assigned a person to investigate who later turned guardian. Gomes talked about “non-appearance hearings,” during which the court approved a multitude of payments, charging her mother’s estate. When Gomes contested the court’s actions, she said the court used her mother’s money to defend its actions. They charged her mother’s estate for numerous trips to the mall and the purchase of stuffed animals. Gomes brought up the well-publicized cases of Maria Long, who has been left penniless by the probate court, and the case of a Disney heir, although declared competent, whom the court refused to release from its guardianship. Stating she totally supports Proposition 115, Gomes emphasized how no one is safe with a living will and living trust under the current system. She also encouraged victims to contact them via e-mail at citizens4clean courts@cox.net so they may become involved. Thomas introduced Clair DiPardo, who said her mother was ripped from her home in Scottsdale, medicated and isolated, without a doctor ever declaring her incompetent. While her mother is still alive, DiPardo said her mother has been victimized by the probate court, which placed her in a nursing home in Prescott where she knows no one and DiPardo is denied visitation. She said the court went through over a half million dollars in a period of 12 months, mostly for duties such as opening her mother’s mail. DiPardo held up a picture of her mother, looking healthy and vibrant, which is how she said her mother looked at the time the courts took over her care. Another concern DiPardo brought up was probate judges don’t know probate law and they look to the attorneys representing the state for guidance. Thomas said this is a nationwide problem and while Proposition 115 will not fix all that is wrong with our judicial system, it is an important first step. Proposition 115 will remove the state bar from the judicial recommendation process and will provide the governor eight nominees to choose from instead of three, along with the applications of the persons not being recommended. Thomas said Proposition 115 will also require all the orders made by judges appearing on the ballot for retention to be posted online, so voters will have meaningful information with which to determine whether or not a judge is worthy of retaining. DiPardo said the victims reached out to Thomas in this effort because he stood up to the system and he too paid the price. He said, “The most powerful branch of the government is not accountable to the people. Thomas said they would be actively campaigning to get Proposition 115 passed.